One of the working methods I started using while I was a student at the Royal Academy of Fine Arts (KASK, 1982-1986) is to compile a book of all the drawings I make. These drawings, often accompanied by notes, serve as preliminary studies for my three-dimensional work. 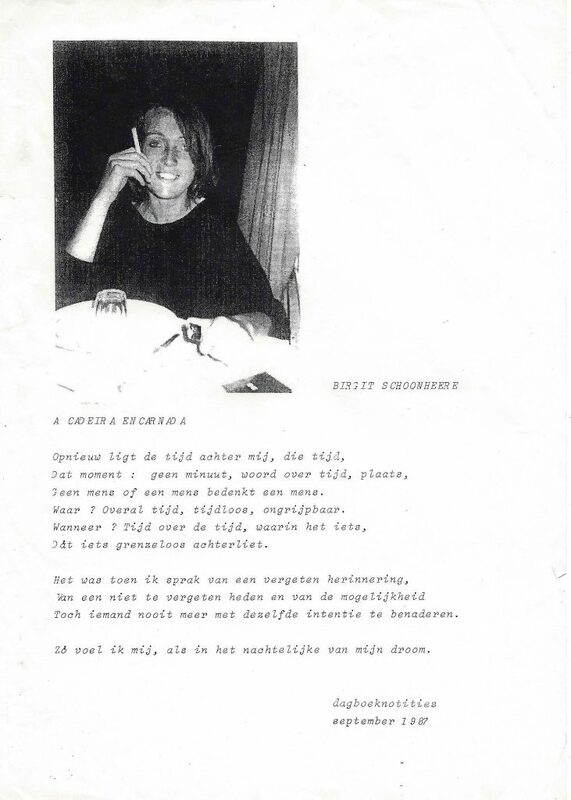 Before entering the Academy of Fine Arts, I explored several other disciplines at the kunsthumaniora (secondary school for the arts) in Bruges (1979 – 1982), such as graphic design, photography, modelling, ceramics and painting. I am still reaping the benefits of this broad basic knowledge today. I went on to draw when I continued my studies in Lisbon (through a student grant at the Escola Superior de Belas Artes de Lisboa 1987 – 1988), frequently wandering through the streets to take photographs. During this period, and later on, I created visual journals, abstract impressions of my experiences or impressions. My basic premise is always to explore subtly, to strike the right balance between colours and fields. I add things to my work, take things away, edit and process – again and again. I keep searching for compositions, until I attain the desired result. Looking at my work, you will clearly see the many layers that result from this frequently quite lengthy process of constant alteration. I have developed as a visual artist, but my approach has actually not changed all that much. I change, I polish, and I use various techniques to achieve my result. Lately I have been taking many photographs while walking in nature. I photograph fragments of water, trees and stones and integrate these into my work. They serve as a foundation for drawing nature and exploring its significance. Sometimes I even draw on a photograph. My works on paper often remain rather small, and are sometimes used as studies for larger-sized works on canvas. The materials I work with are acrylic paint, pencil, ink and even oil pastel. My work ranges from figurative to abstract. The basic idea from which I depart always remains palpable in the result. My work never stops; I start over and over again. A little like nature, my source of inspiration: that universal phenomenon that strikes a chord with all people. The human figure is absent from my work in the literal sense. Nevertheless, viewers will quickly get the impression that they are part of a certain presence. Somehow they feel that they are joining someone else on a walk through my work.